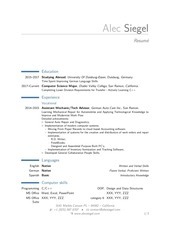 This PDF 1.3 document has been generated by 3B2 Total Publishing System 8.07f/W / Mac OS X 10.10 Quartz PDFContext, and has been sent on pdf-archive.com on 12/11/2014 at 10:09, from IP address 129.215.x.x. The current document download page has been viewed 467 times. File size: 188 KB (7 pages). step2 visual objects in a language they were learning (Spanish). step4 overcoming interference during the early stages of secondlanguage acquisition. words used fluently for most of one’s life? Here we offer an account of this ubiquitous experience that focuses on the interaction of executive-control mechanisms with long-term memory. words may reflect an adaptive role of inhibitory control in hastening second-language acquisition. show implicit benefits for processing it (e.g., Pallier et al., 2003). 1991; for a related argument, see Gollan &amp; Acenas, 2004). may also partly arise from the opposite circumstance: consistently expressing concepts with new phonological labels. 1994; see Fig. 1). 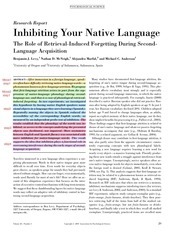 This analysis suggests that first-language attrition may be related to a phenomenon known as retrieval-induced forgetting (RIF; Anderson, Bjork, &amp; Bjork, 1994). may be a factor in producing first-language attrition. they intrude and block access to the weaker, unpracticed items. asymmetry exists between one’s native and second languages. 32 in Experiment 1 and 64 in Experiment 2). presented with the first letter of the word to be recalled. refresh their memory for the Spanish words. Fig. 2. Performance on the final rhyme-cued recall test in Experiment 1.
times. Mean SE 5 3.7%. word on the phonological independent-probe test (see Fig. 2). earlier phases were excluded, the pattern of results remained unchanged. paradigms. For another example and further discussion, see Johnson and Anderson (2004). SEs 5 4.1% for the small-difference group and 4.3% for the large-difference group. language,4 F &lt; 1 (see Fig. 3b). test and 4.5% on the semantic test. than after 1, F(1, 16) 5 13.60, p &lt; .005, Zp 2 ¼ :459.
speakers showed substantial phonological inhibition (see Fig. F(1, 32) 5 10.2, p &lt; .001, Zp 2 ¼ :242.
equivalents, the underlying concepts grew more accessible. the same cue used to perform retrieval practice (the object). regulate interference (Anderson, 2003; Bjork, 1989). (pp. 265–326). San Diego, CA: Academic Press. cause forgetting: Retrieval dynamics in long-term memory. Journal of Experimental Psychology: Learning, Memory, and Cognition, 20, 1063–1087. mechanisms in cognition: Memory retrieval as a model case. Tulving (pp. 309–330). Hillsdale, NJ: Erlbaum. forgetting in implicit memory tests: The role of test awareness. Psychonomic Bulletin &amp; Review, 12, 490–494. 361). Berlin, Germany: Walter de Gruyter. and Tagalog-English bilinguals. Journal of Experimental Psychology, 30, 246–269. system. Bilingualism: Language and Cognition, 1, 67–81. Isurin, L. (2000). ‘‘Deserted island’’ or a child’s first language loss. Bilingualism: Language and Cognition, 3, 151–166. translation equivalents: Implications for first language forgetting. Memory &amp; Cognition, 29, 312–319. Psychology: Learning, Memory, and Cognition, 31, 964–979. language attrition (pp. 139–151). Cambridge, England: Cambridge University Press. first? Cerebral Cortex, 13, 155–161. Seliger, H.W., &amp; Vago, R.M. (Eds.). (1991). First language attrition. This file has been shared by a user of PDF Archive. Document ID: 00193755.